Our Mission: Housecall Providers is dedicated to providing home-centered medical care, integrating primary, palliative and hospice services for homebound members of our community. We offer compassionate physical, emotional and spiritual support through life’s journey. Vision: To sustainably transform home-based medicine so all homebound adults and those living with serious illness have access to care that improves their quality of life. We pride ourselves on delivering unparalleled medical care to the homebound and chronically ill members in our community. Patients are able to take full advantage of the range of benefits and services offered through our program. Care plans reflect a patient’s life circumstances and treatment wishes. The House Call is Back Patients receive quality medical care in the residence of their choice, be it in a private home, residential setting or an adult care home. In addition to our primary care practice, we offer palliative care and hospice services so our patients can complete their lives with dignity, respect and compassion. 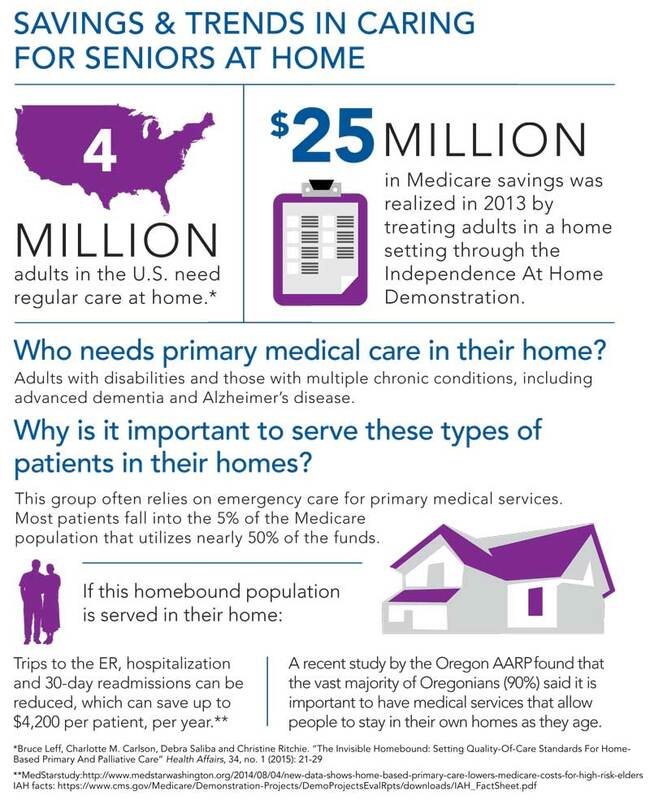 The Triple Aim is Real at Housecall Providers In home medical care for homebound patients is proven to increase patient comfort, improve health outcomes and reduce health care costs. * Housecall Providers has saved Medicare millions of dollars, while providing better care to our patients, ensuring greater patient comfort, improved health outcomes. Read more about the IAH Demonstration Project. *With the population aging, more people are suffering from multiple chronic conditions and degenerative diseases. This trend will continue as roughly 11,000 baby boomers a day enter the Medicare system.